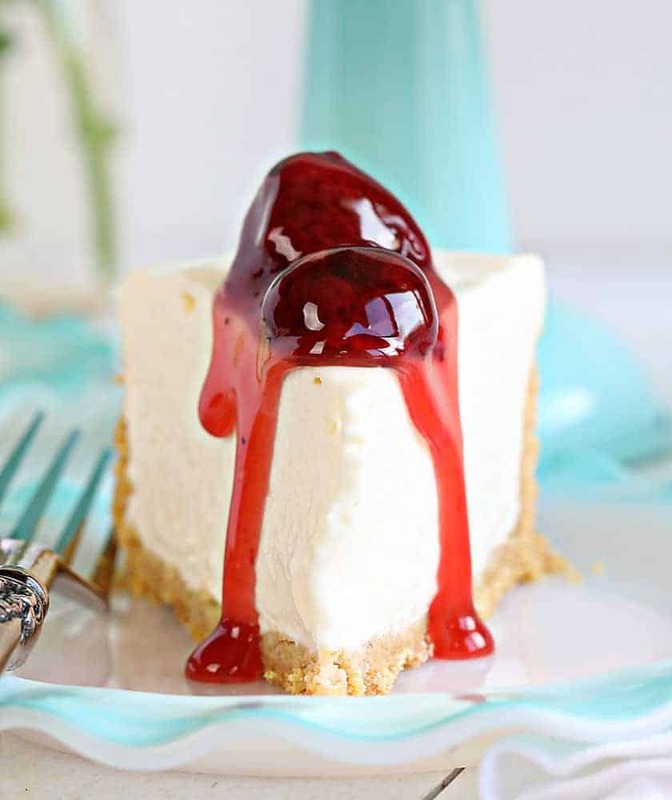 Are you are craving the silky smooth delightfulness that is Cheesecake but don’t want to turn on your oven? I have found the perfect No-Bake Cheesecake recipe for you! So what exactly is a no-bake cheesecake? Simply put it’s a cheesecake that’s never seen the inside of an oven. Neither the crust nor the filling is baked, making it truly a no-bake dessert. So how do you make a crust that is no bake? It’s simple! I use the standard ingredients of graham cracker crumbs, sugar, and butter, but I make extra sure that every single crumb is covered with butter. The butter will act as a binding agent when it cools ensuring a beautifully firm and delicious crust. 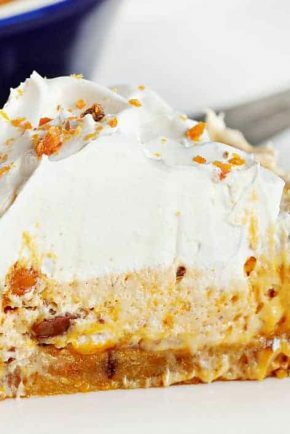 The filling for this no-bake cheesecake recipe is made with a special ingredient, heavy whipping cream. 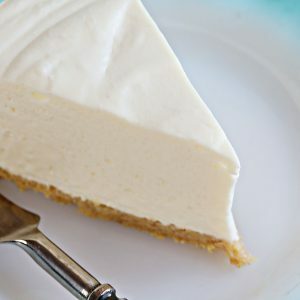 I have made several no-bake cheesecakes with the traditional sweetened condensed milk and always find that it tastes a bit different, or noticeable. So I went on the search for a recipe that would not use sweetened condensed milk and that would stand up to a classic baked cheesecake. 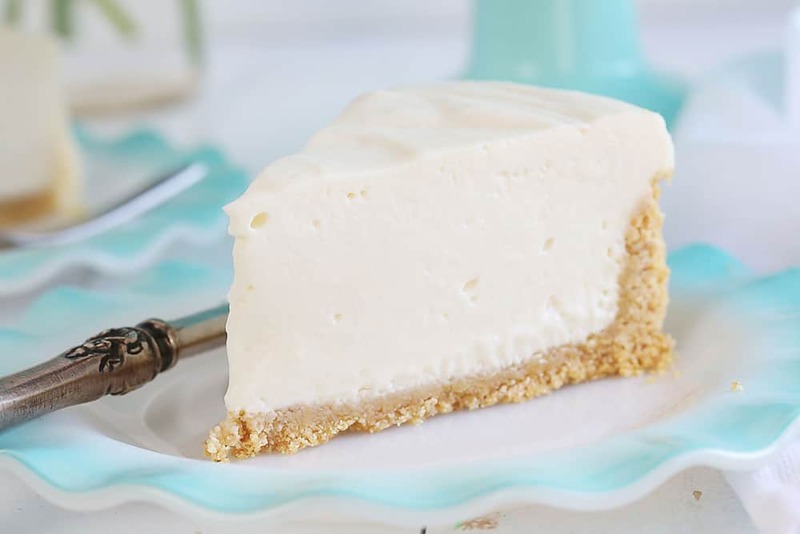 The original recipe I found was on Serious Eats and after making it several times and making slight adaptations, I know that I have finally found the PERFECT No-Bake Cheesecake! Because we are using heavy whipping cream in this recipe it is essential that it chills in your fridge for at least 6 hours before serving. Overnight works best! Also be sure to note that I used 2 different attachments with this recipe, the paddle and the whisk. Using these attachments at the specified times is important and ensures you will have the best no bake cheesecake! I also used fresh lemon juice. I don’t recommend using a store-bought lemon juice as it doesn’t work as well and you can almost taste the difference. 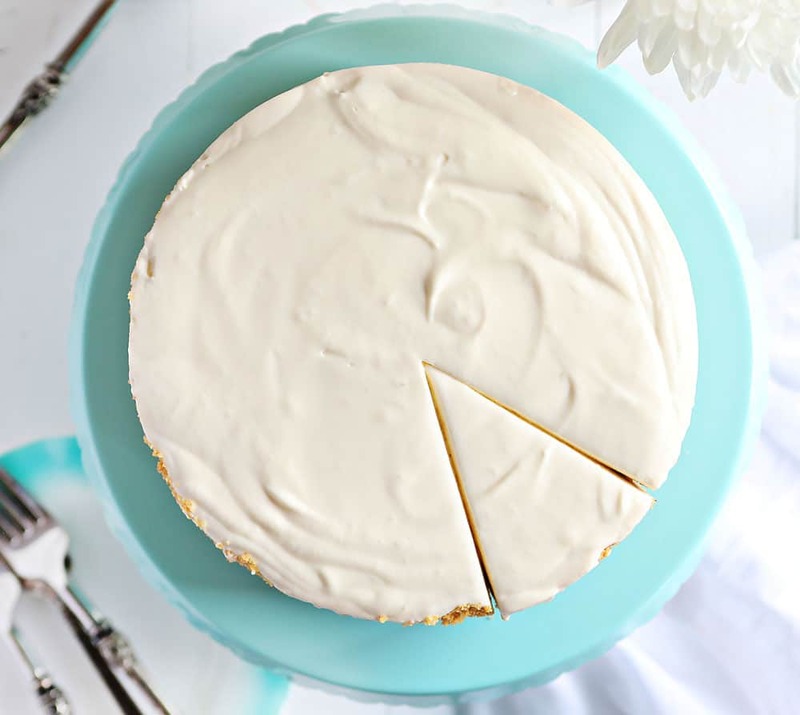 When it comes to how you serve this cheesecake, the sky is the limit! You can add pie fillings (I added strawberry pie filling in the video and in a picture below) but blueberry, cherry, lemon, and raspberry also taste amazing! 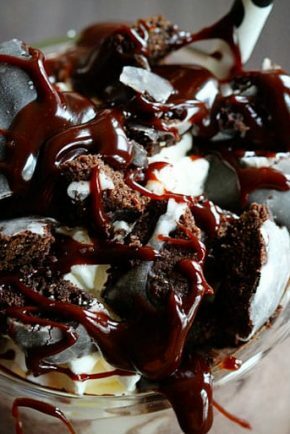 You could also drizzle chocolate on top and a healthy dollop of whipped cream for some extra richness. By far my favorite way to eat this no-bake cheesecake is with fresh fruit. I love it with blueberries and kiwi and my kids grab fresh strawberries. 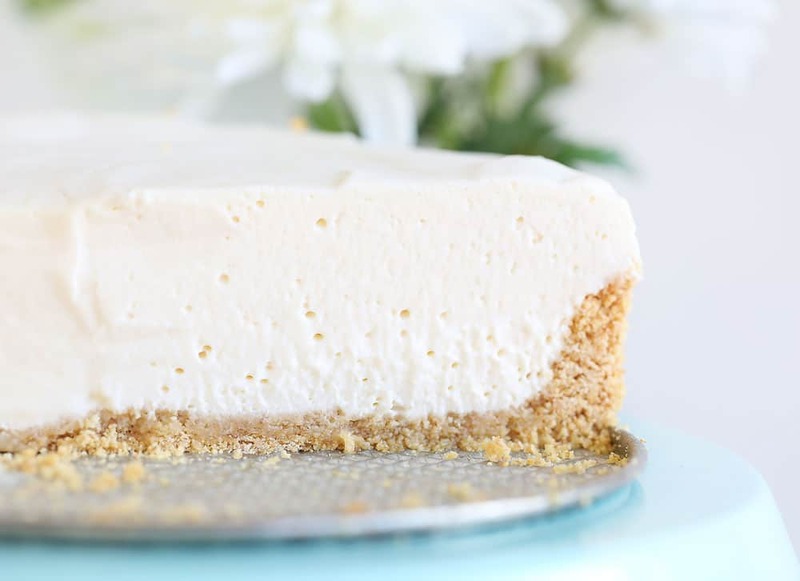 This no-bake cheesecake is the perfect dessert for summer! 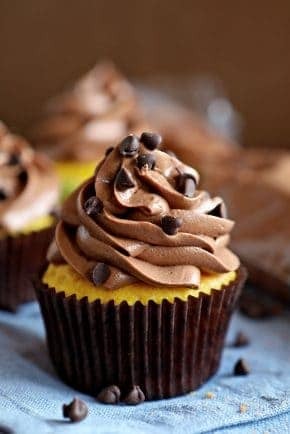 It comes together quickly, uses only a few simple ingredients, and tastes AHmazing! Here is a full video tutorial on how I make this amazing No-Bake Cheesecake! 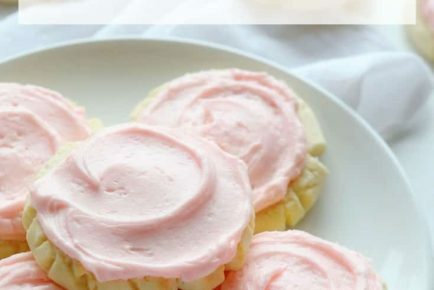 Smooth and creamy and no oven needed! Combine graham cracker crumbs, sugar, and melted butter in a small bowl. Make sure to get every crumb coated with butter. Pour into a 7-inch springform pan. Spread into an even layer, then compress firmly with a measuring cup making sure to press up the sides of the pan. Set aside. 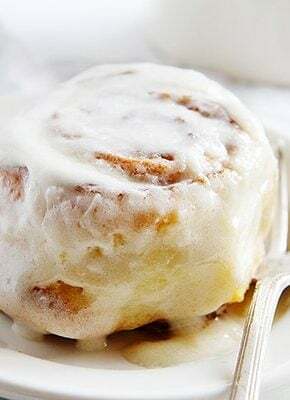 Combine the cream cheese, sugar, lemon juice, vanilla, and salt in the bowl of a stand mixer fitted with a paddle attachment. Mix at medium speed until soft and smooth. Scrape the bowl as needed. Switch to the whisk attachment and pour in the cream. Mix at low speed to combine, then increase to high and whip until the mixture can hold stiff peaks, 3 to 5 minutes. Refrigerate until the filling is firm and cold, about 6 hours or overnight. Make sure to whip your heavy cream well, at least 3 minutes. You want the consistency to be fairly firm. If you have chilled it for 6 hours in the refrigerator and it’s still not fully set, pop it in the freezer for about 30 minutes. The cheesecake should not freeze but will be firm. 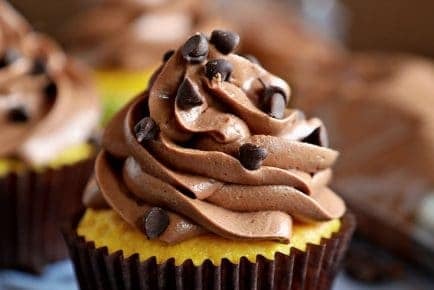 Tus recetas de postres haces que se vean simples, sencillas y deliciosas, gracias por mostrar tu pasión, saludos desde México!!!!! 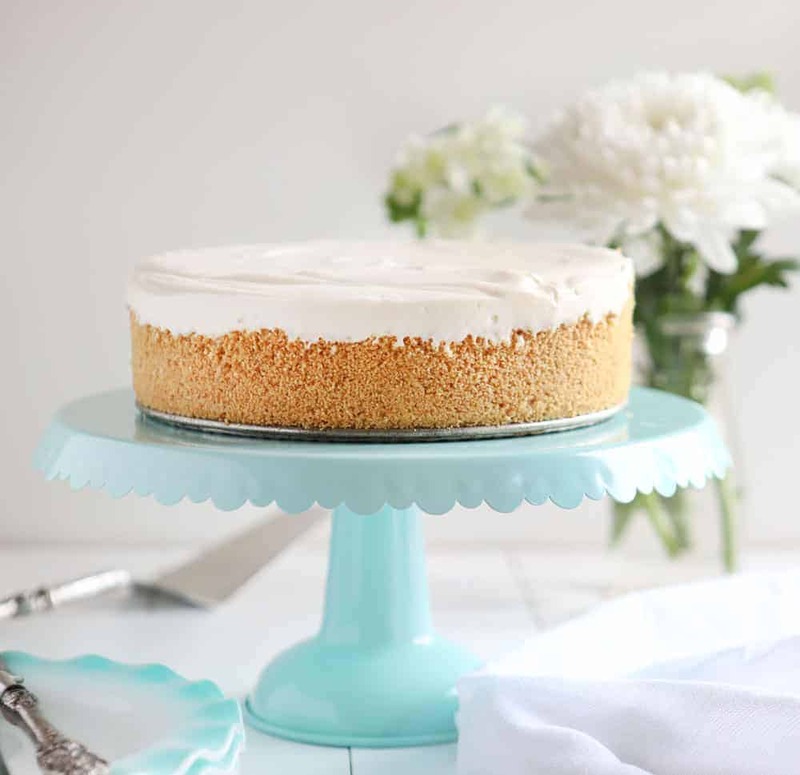 I made this cheesecake yesterday – beat the heavy cream in to the cream cheese for 4 minutes. I let it set for about 24 hours in the fridge. It seemed firm but it wasn’t. I now have it in the freezer and am hoping to cut a nice slice in about 30 minutes. I do have one question…the crust is hard to cut through – was that to be expected? I’m having a hard time managing a soft cheesecake and hard crust. Any tips would be appreciated. And regardless, it tastes terrific! You are a lifesaver! I used your recipe as a filling in raspberry parfait with vanilla wafer cookie crumbs. I needed a dessert in a hurry and did not have time to let it set-up in the fridge. I made your cheesecake filling in a very short amount of time and assembled individual parfaits in 9 ounce clear plastic cups. As soon as the last raspberry garnish was on top of the last cup, I put my trays in the car and drove straight to the event where they were being served. They were a big hit. Your recipe saved the day! Thank you! Love the additional of almond extract!! Can’t wait to try the Red Velvet & the Easy Cheesecake.. Both look easy & doable!! I had to refrigerate the filling and rewhip once it was very cold. I haven’t made this yet but I’m curious… Has anyone tried using knox unflavored gelatin to help firm this up?